In 2013, they gave us the monster dancefloor anthem “MAAHI VEH MAAHI”. 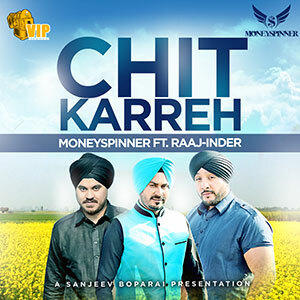 “CHIT KARREH” features the raw, fresh and powerful vocals of Raaj-Inder. Raaj-Inder, a singer based in the Panjab met MoneySpinner through Sanjeev Bhoparai whist he was performing at UK melas in 2013. Raaj-Inder was looking for a UK sound with a difference and the collaboration took place late last year. MoneySpinner, known for their desi, yet distinctive sound have given the listeners something which that will leave them buzzing and wanting more with this one. ‘Chit Karreh’ is definitely a summer track which lyrically and musically takes you on a journey leaving you on a musical high. The music video was shot in Panjab and the visuals accompanies the track well.Very rich colourful and full of Panjabi roots. The video also highlights the singing and acting qualities of Raaj-Inder, who will surely become a regular feature in the Bhangra Scene for years to come.